About 20 years ago we identified Aphanomyces root rot as one of the major limiting diseases of alfalfa across much of the U.S on poorly drained soils. This fungal disease causes death in seedlings and poor seedling growth of alfalfa in slowly drained fields. Seedlings infected with Aphanomyces yellow and die and remain turgid for a couple days, whereas Phytophthora and Pythium diseases tend to wilt and kill seedlings quickly before plants become severely chlorotic (yellow). If aphanomyces infected plants survive the seedling stage, they will remain yellow and stunted as in picture below. Aphanomyces will also reduce yield in established alfalfa stands due to reduced root growth and poor nodulation which results in yellowed, stunted plants. If an alfalfa variety highly resistant to Phytophthora was planted and there is still the yellowish stunting, the field is likely infected with Aphanomyces. Aphanomyces root rot may also increase winter/spring root heaving damage to alfalfa. Infected fields are likely to remain infected and low yielding for the life of the stand. In addition, if Aphanomyces induced stunting and yellowing is occurring in a field where an “aphanomyces resistant” variety was planted, the variety had race 1 resistance and the field is infected with race 2 Aphanomyces. There are several races of Aphanomyces. Race 2 resistance is a multiple race resistance that is resistant to race Race 2 and several other races. Race 2 Aphanomyces is especially common in Western Wisconsin, Southeastern Minnesota, northwestern Iowa and Northern Illinois and is rapidly being identified in other areas. 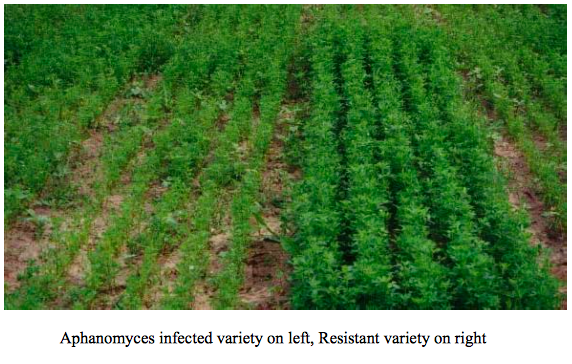 When Aphanomyces symptoms occur in fields planted to race 1 resistant Aphanomyces varieties, growers should consider planting race 2 resistant varieties. A number of new alfalfa varieties are coming on the market that are resistant to race 2 Aphanomyces. These varieties are also resistant to race 1 of Aphanomyces.